Call: Jumana Schriefer on 0266220300. Email: Jumana Schriefer at boxoffice@norpa.org.au. 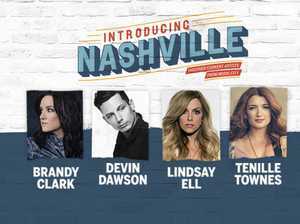 A 2-hour show featuring some of Nashville's most exciting established and emerging artists – Brandy Clark, Devin Dawson, Lindsay Ell and Tenille Townes! INTRODUCING NASHVILLE is the brand new international artist touring series, presented by the Country Music Association of America. A four-artist bill featuring some of North America’s most exciting established and up-and-coming artists – Brandy Clark, Devin Dawson, Lindsay Ell and Tenille Townes – will take in intimate venues across Australia this March. Designed to introduce current artists from Nashville to music fans around the world, the two-hour seated show will present artists on stage together, in a rare stripped-back environment. Mirroring a quintessential Nashville writers round, Introducing Nashville will see artists take turns to introduce their songs, sharing the stories behind the tracks, along with personal life and career experiences; these shows are an opportunity for Australian audiences to catch a unique glimpse into the lives and art of some of their favourite Nashville artists. Punctuated by unrehearsed banter, and with each of the artists featured occupying different lanes musically, music lovers will come away from the evening having experienced a true cross section of what is coming out of Music City right now.